Well performance in North American shales has improved significantly. The United States and Canada have been driving global shale production. Out of the 15.6 MMboepd produced from shale last year, 99% of the production came from North America. 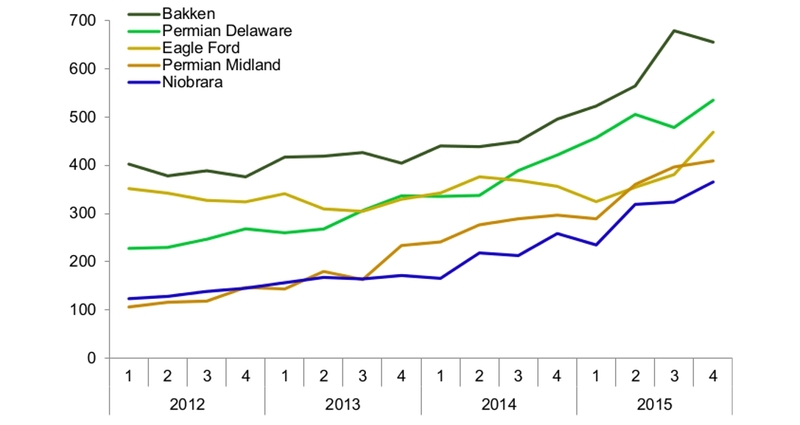 Shale production from this region has proven to be highly resistant to the low commodity prices. One reason shale is surviving in the current price environment is because companies have shifted their exploration focus. When prices were high, shale producers actively explored for the next big play, mainly through drilling exploration wells on new acreages. As the oil price started to drop, producers returned to their core areas. The shift in focus then centered on improving completion techniques and increasing the recovery per well. The impact of this activity is illustrated below. The chart shows the average estimated ultimate recovery (EUR) for oil per well for selected US shale plays split on the quarters the wells started up. The chart shows considerable improvements in the production volumes per well, especially in 2015. On average the resource per well increased by 45% from the beginning of 2014 to the end of 2015. For Bakken, the play with the highest oil estimated ultimate recovery, the number increased from 400 Mboe to above 600 Mboe. Meanwhile, Niobrara’s EUR more than doubled during the same period, from 150 Mboe to above 350 Mboe. There are several reasons behind these increased well performances. Companies are targeting the best drilling locations, and are drilling wells with longer laterals and well flow optimization, which accounts for some of this increase. Improved microseismic has also enabled the drillers to perform more efficient well placement, while better completion techniques, such as slick water, have enhanced the fracking process. While well performance improvement has been a key challenge for shale producers over recent years, it is a challenge they have delivered on. This knowledge will be vital when exploration of new acreage starts up again, and will help more basins to be commercial. If you have an interesting story to tell, how do you get your message across to colleagues, to the oil industry – and to the rest of the world?